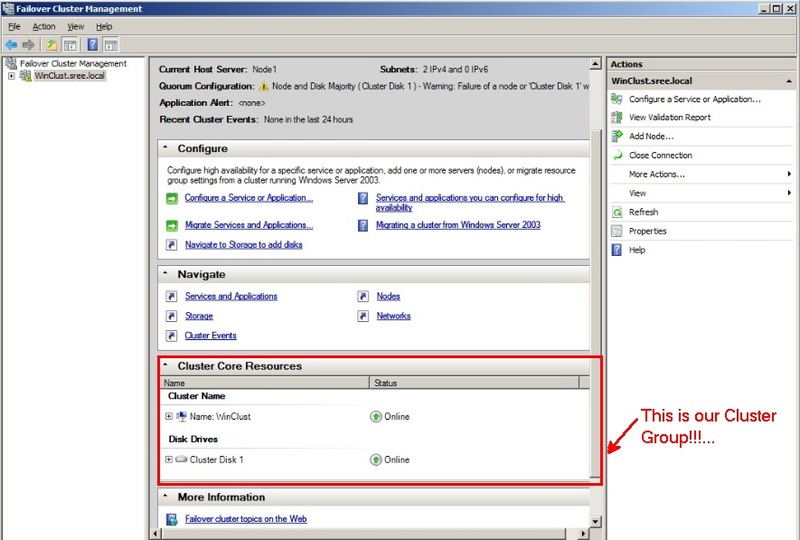 If you worked a long time on Windows Server 2003 Clusters, you will definitely know what a cluster group is. In 2003, we used to have a concept called “Groups”. 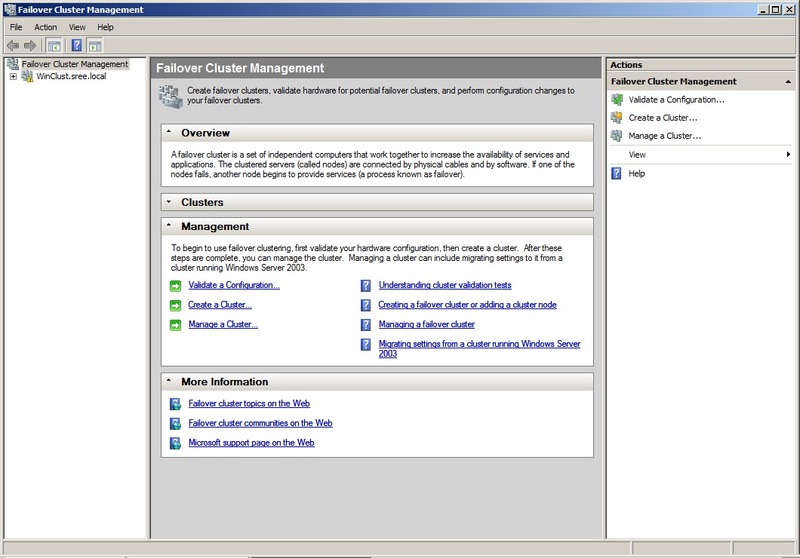 One of the groups which it displays is “Cluster Group”, when you open your Cluster Administrator(Cluadmin). If you are new to clustering, just to keep it very simple Cluster group is the Core of your Cluster. If your Cluster group is down, basically your entire cluster(all the applications, resources etc) are down. Things got drastically changed starting Windows Server 2008. Basically we should no longer call it as “MicroSoft Cluster Services(MSCS)“. They renamed it to simply “Failover Cluster Services”. IMHO, this makes it very clear that we are not referring to NLB(Network Load Balancing) – which is one of the flavors of Clustering Services offered by Windows Servers. Note: Failover Cluster and Network Load Balancing Cluster are completely two different entities, no way related to each other. 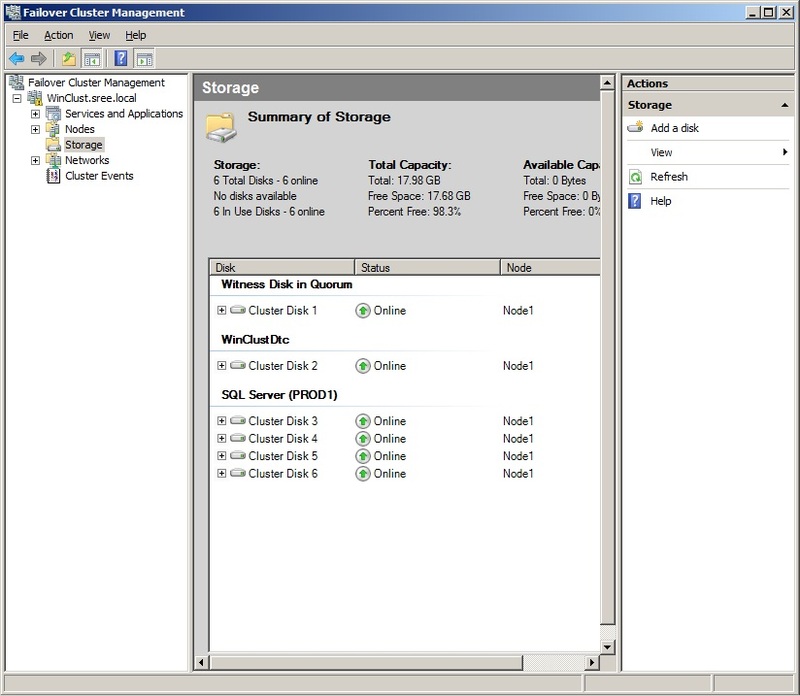 Anyways, let’s see where can we see the cluster Group in Failover Cluster Manager in Win Server 2008. Assuming you’ve already Installed FCS(Failover Cluster Service), once you navigate to your Administrative tools and open Failover Cluster Manager(GUI to Manage your Failover Cluster), you’ll see something very similar to the below Screeshot. Typically we expand our Cluster and navigate to our Services and Applications, Nodes, Networks to manage our SQL Servers! But you are not able to see the actual Cluster Group anywhere as shown in the below Screenshot! 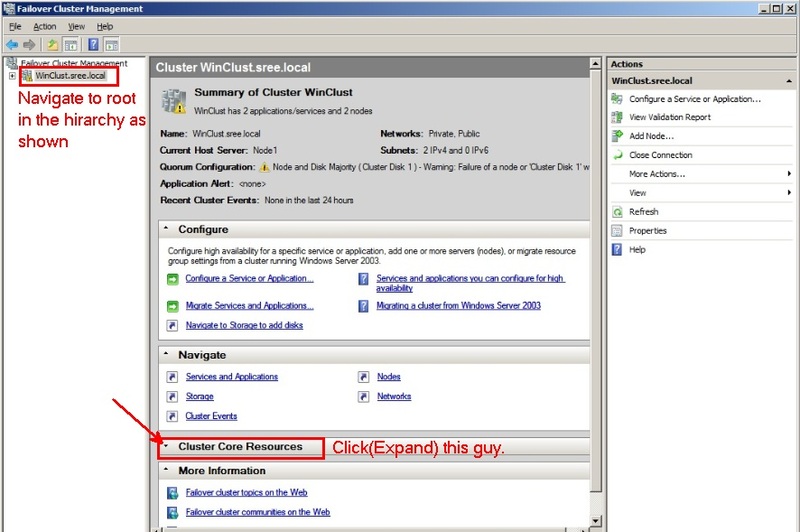 All you’ve to do is to Navigate to the Main Windows cluster and expand “Cluster Core Resources“(This will be collapsed by default) as shown below. If you are more CMD/PS person, One Simple Way to get the list of all the Groups within our Cluster from CMD is just typing “CLUSTER GROUP” from your Command Prmt! You can see the Below Screenshot from one of the nodes in my Failover Cluster. 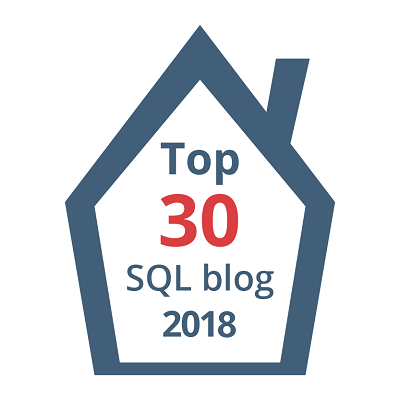 Previous Article Installing/How to Install MySQL 5.5.16 on Windows? Next Article Snapshots in Report History/ ReportServer Database Growing Big! This article is very helpful with detailed steps. Thank you so much for sharing this important stuff. Just wanna give one comment, I understand that this article is purely in LAB environment and I am sure you knwo that we can’t follow this article 100% when we are installing in Prod or in DEV servers (in companies). Minor modifications are needed right, so if you can add some comments at the places where we need to do extra steps when doing on Prod that will be much convinent. 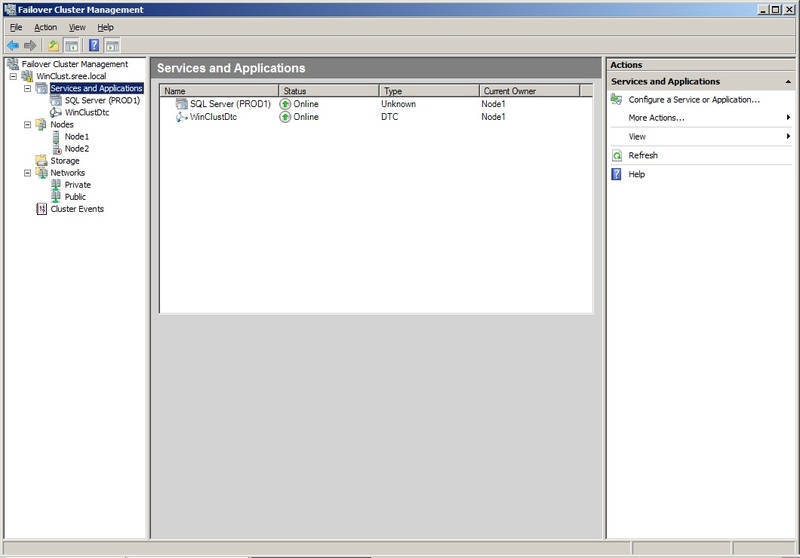 Just as an Ex: While installing SQL Server on Node1 in one of the places where we define the “cluster security policy” we can’t define SIDs as MS recommended we have to create a seperate group in AD and make it a domain admin and then define that group name in this screen. So people like me who are doing for the first time might face little problem while following this article. Again Thank you so much for gathering this detailed info. Hi Sreekrishna- Glad it helped you! I would little contradict with the statement “this article is purely in LAB environment” which you’ve stated. The SQL Installation part which I’ve shown here is pretty much same on what you would do on your Production Environment. The only reason I’ve explained DCPROMO, SAN, Windows Clustering is because that’s the bare minimum you would need to be able to create a SQL Cluster on your Laptop. I Agree I’ve violated few Rules such as Disabling Firewall, UAC etc. The only intention was to make things easier. You can be more creative while Setting up your own cluster simulating real corporate policies. Well, In reality, we SQL DBA’s will not be responsible with creating Domain, SAN, dealing with NIC’s, not even setting up Windows Cluster. BTW, I didn’t got the below point..
“we can’t define SIDs as MS recommended we have to create a seperate group in AD and make it a domain admin and then define that group name in this screen.” Just want to make it clear, We should never ever make our SQL Service accounts as Domain Admins in Production Environment!! !….Huge Huge Blunder. Now you are increasing Attack surface at your domain Level!! !……It should not even be a local admin on the server if possible. In the very first paragraph in part6, I’ve mentioned what I’ve done as prerequisites! BTW, If you are Installing SQL Server cluster on Windows Server 2003, then Domain Groups are Mandated and there is a requirement that service accounts needs to be added as members of that DG’s. You should not see any issue selecting Service SID’s starting Win Server 2008. Let me know for any questions!